The 5,000-year-old pieces mark the oldest known instance of a "board game". Archaeologists have unearthed a series of small, carved stones, assumed to be some kind of ancient board game's pieces, in a 5,000-year-old burial mound in Turkey. The elaborate pieces consist of 49 small stones sculpted in different shapes and painted in green, red, blue, black and white. The discovery marks the oldest known instance of a "board game," with Haluk Sağlamtimur of Ege University in İzmir, Turkey, describing it as a "a rather complete set of a chess-like game." "Some depict pigs, dogs and pyramids, others feature round and bullet shapes. We also found dice as well as three circular tokens made of white shell and topped with a black round stone," Sağlamtimur told Discovery News. "We are puzzling over its strategy." Sağlamtimur and his team claim that their find confirms that board games first originated from the Fertile Crescent regions and Egypt more than 5,000 years ago. 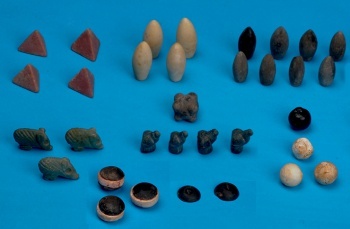 Some badly preserved wooden pieces and sticks were discovered along with the stone tokens, but the accompanying game board has yet to be found. "According to distribution, shape and numbers of the stone pieces, it appears that the game is based on the number 4," said Sağlamtimur. He hopes the discovered peices will provide some hints on the rules and logic behind the game. The real question is how long will it be before Hasbro starts selling "Ancient Turkish Adventure: The Board Game"? Sağlamtimur was unable to find the dog from my Monopoly set in the mound, and suggested I check in that hard-to-reach area underneath the fridge.